I have been quite busy the past few weeks and haven't really had much time to come online, let alone blog. This blog is about Quaid-e-Azam Muhammad Ali Jinnah, the founder of Pakistan in honor of his birthday today, which also happens to fall on Christmas so Merry Christmas to all reading. The television has been showing stories about Jinnah's life and newspapers are flooded with anecdotes regarding the Quaid. Jinnah's tomb today has been site to millions attending a historical rally by the political party Pakistan Tahreek-e-Insaf (PTI). However despite all the stories about his political achievements and leadership persona, the one that captivated me the most is something personal about the enigmatic, charismatic leader who has been very secretive about his private affairs. "Darling- thank you for all you have done. If ever in my bearing your once tuned senses found any irritability or unkindness- be assured that in my heart there was place only for a great tenderness and a greater pain- a pain my love without hurt. When one has been as near to the reality of Life (which after all is Death) as I have been dearest, one only remembers the beautiful and tender moments and all the rest becomes a half veiled mist of unrealities. Try and remember me beloved as the flower you plucked and not the flower you tread upon. Darling I love you - I love you - and had I loved you just a little less I might have remained with you - only after one has created a very beautiful blossom one does not drag it through the mire. The higher you set your ideal the lower it falls. 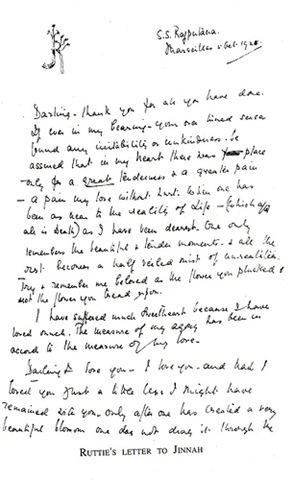 I had written to you at Paris with the intention of posting the letter here - but I felt that I would rather write you afresh from the fullness of my heart. R."
The above letter was written in Merseilles, France on 5 October 1928. The reason I felt like sharing this letter on my blog is because it seems to have captured Ruttie's feelings in it. When reading it, one cannot help but be gripped by the intensity of her feelings for Jinnah, along with a haunting shadow of sadness woven in her words. 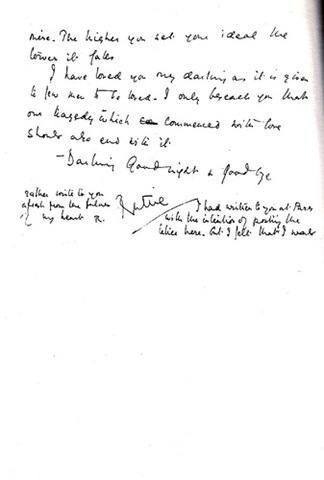 The fact that Jinnah and Ruttie never stopped loving each other despite the misunderstandings remains undisputed. The founder of our nation Mr. Jinnah has been very reserved in showing emotions except on two occasions. Jinnah could not control his sadness on Ruttie's funeral and also when he went for the last time to visit Ruttie's grave before leaving for Pakistan. I hope the two are happy and finally together in life after death. Posted below is the original version of the letter.